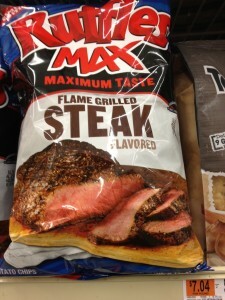 Apparently this is the year of the meat flavored chip. A few months ago I tried Lay’s chicken and waffle chips which were just awful. You would think that would dissuade me from trying steak flavored chips, but no, I saw these in the supermarket and knew I had to buy them. I’m happy to report they aren’t bad, but they aren’t good either. They are coated in steak seasoning which is reminiscent of a smoky BBQ chip. Impressively, they do manage to have a beefy essence. It’s very strange - I’m not even sure if it is from the seasoning or just something in the aroma. Perusing the ingredient list didn’t help solve the mystery; Natural meat flavor is listed amongst the ingredients. I would say they worth the $1.09 I paid for the snack sized bag just for the novelty of it and unlike the chicken and waffle chips, I have more than just one. I’m waiting for Frito-Lay to develop ham chips next. Ruffles Max has a “Loaded Bacon & Cheddar Potato Skins” flavored chip – does that count?